Another masquerade gown! I must confess I’m getting a little bored of recoloring but I’m learning a great deal. I think, though, that I’ll start doing new things next week. I’ll try for a Monday, Wednesday and Friday schedule. 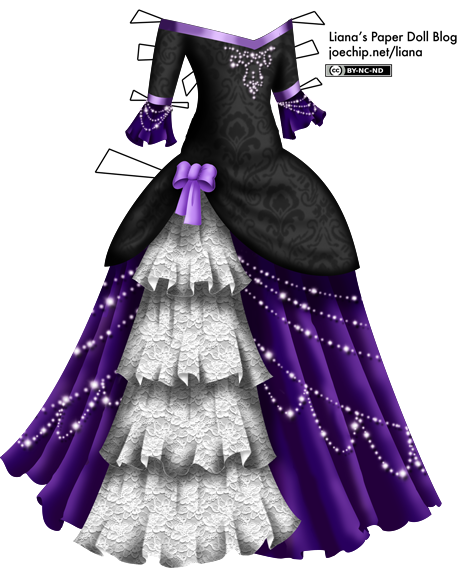 The lace and the sparklies are from Obsidian Dawn and the damask pattern is from sofi01. The contest I had going has already been won… Sarah, tell me how you’d like me to color this one, please! Sparkle Week continues! 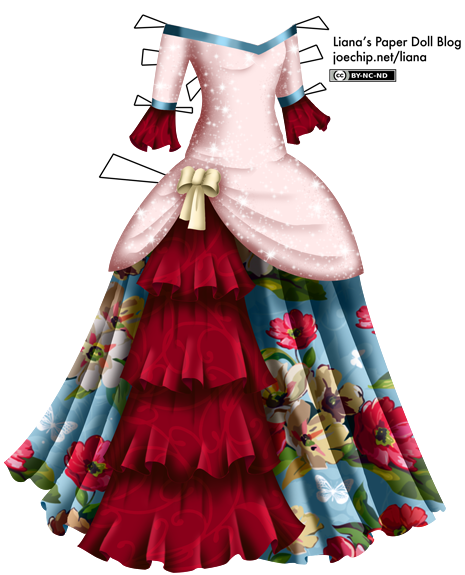 I must admit that everything I know about making fabric sparkle in Photoshop I learned from the Disney princesses. Yesterday was sparkles over dark color, today is sparkles over light color. I made this brush myself, too, with help from this tutorial. The pattern on the red fabric is from Pixels & Ice Cream, and the pattern on the skirt is from flashtuchka’s Vintage Floral Patterns. My pride causes me to say I’m not scared of spiders, I just don’t like looking at them. If I put it that way, it’s perfectly reasonable to do things like cover up a picture of a spider when I’m reading a book, or avoid the tarantula exhibit at the zoo. When I was a little kid, I was scared of black holes, and I feel like I’ve gone down in the world since I stopped fearing the random indifference of the universe and picked up such a pathetically obvious, stupid, gendered weakness. I know perfectly well they’re more afraid of me than I am of them. I know they eat lots of annoying bugs and that they’ve only got two more legs than ants (which I don’t mind at all). I know I can kill them perfectly well myself, and I do, if there’s no other option. I put on my heaviest shoes and make a lot of noise, cursing each stupid spider leg and shouting warnings to all the other spiders that they’d better stay well out of my sight, or they’re gonna get it too. I calm myself down by calling up my husband and telling him “I killed a spider!” just like a normal person might say “I got a promotion!” or “I won a new car!” Kind man that he is, he indulges me. If you were to stalk me over my various online activities, you’d notice I almost never mention this fear, because I’m just paranoid enough to consider how people could use it against me. There’s no real reason to share with the world how to yank this particular chain. But oh well — it’s Halloween, and while I amuse myself with ghosts, vampires and sorceresses, I don’t believe in the supernatural. I’m mostly just frightened of the quirks and instability of the human mind… and spiders. 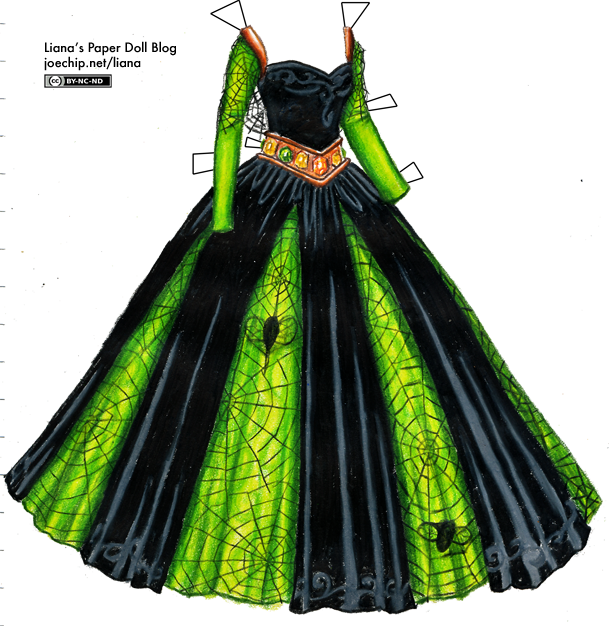 What do spiders have to do with this gown, do you wonder? Well, there’s the spiderweb lace, and a couple of twitchy, fat flies caught in it. There must be a spider around somewhere, don’t you think? Ah, yes. A gigantic one, four feet long, with spindly long legs and a full set of eyes. Does that make the whole dress different for you? It does for me. I’ve drawn nothing, but all the same it’s still there, just like those spiders that disappear behind furniture while I’m still dithering about looking for my shoes. Now, is it merely embroidered or painted on? Or does it cling to the thin lace on the petticoat, waiting for its host to lure some prey away from the party and into the shadows? Dance with the lady in black and green at the Halloween ball this year, if you like, but I hope you will have the sense to leave that particular mystery well alone. When my mom told me how impressed she was with the burgundy velvet on the Good Queen’s gown, I felt like such a fraud. It’s basically two colors applied thickly and not overlapping, with just a touch of black and a bit of the colorless blender – pretty easy, honestly. In any case, it was the first time I’d tried that effect, and it was such fun that I thought I’d give it another shot, so I ended up with this party dress. There is not much to it other than an excuse for me to play with this technique! 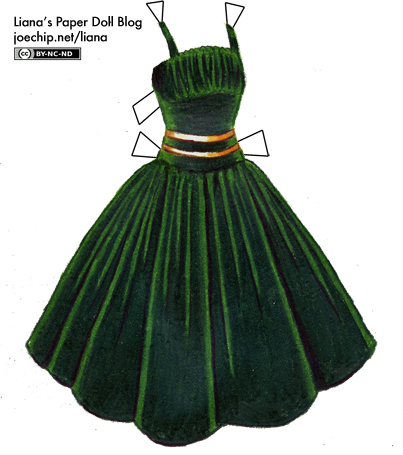 Prismacolors used: Goldenrod, Bronze, Cream, Dark Umber, Dark Green, Apple Green and Black – however, apple green felt too bright compared to the dark green, and the colors of dress you see were changed in Photoshop.